Today's Vienna shows to the alert traveller an unusual layout of its monuments: the relatively small city centre grouped around the old cathedral is surrounded by a large ring of XIXth century large buildings and gardens and beyond that ring there is another one with the main monuments of the XVIIIth century. This unusual lay-out is explained by the massive fortifications which surrounded the old city: not only walls, but also projecting bastions, ravelins, ramparts and a wide ditch. The fortifications were built in the XVIth century following Venetian patterns. 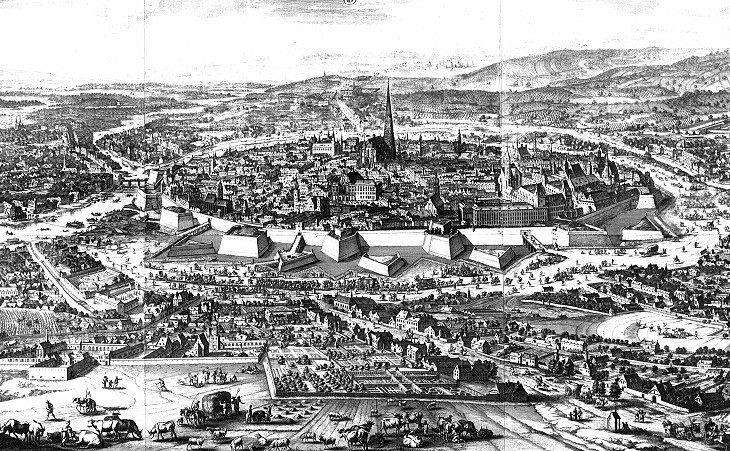 In the early XVIIIth century Vienna, due to the 1683 defeat of the Ottomans and to the ensuing expansion eastwards of the empire, saw a great increase in its population which could no longer be contained in the old city. The new settlements outside the walls soon came under threat of being raided, as the Habsburgs' heavy taxation of the Hungarian peasants led at the beginning of the XVIIIth century to a general upheaval (the Kurucok revolt 1703-11). A new system of fortifications was therefore built to protect the enlarged city, but without dismantling the old one. In 1857 Emperor Franz Joseph approved a plan to merge the two parts of Vienna by pulling down the old walls and by replacing them with modern buildings and large gardens. The sites of the old bastions are sometimes noticeable because of short flights of steps linking different ground levels, of modern inscriptions commemorating episodes of the 1683 siege of Vienna and of short stretches of walls, which were not pulled down to preserve some buildings of historical value. It took more than thirty years to complete the large building program associated with the pulling down of the walls. It was a bonanza for the architects who designed all sorts of "neo" buildings with a preference for Neo Renaissance, Neo Gothic and Neoclassic architecture (but there was also room for an imposing Neo Tudor palace). Some architects eventually took objection to this sort of catalogue of past architectural styles and Vienna saw the development of two very new schools of thought. Adolf Loos designed for a building, located right opposite the elaborate XIXth century addition to the Imperial Palace, a definitely no-frills façade, to the great distaste of the emperor himself. Otto Wagner thought it proper to develop an original set of decorative themes, which while being consistent with the old monuments, were not just copies of styles of the past. Note: the marble decorating the lower part of Looshaus is cipollino, a kind of marble which can be seen in many monuments of Rome. The image used as a background for this page shows a section of the Renaissance walls of Rome.